Our top two priorities at Stellar Dobermans are temperament and health. Our puppies become loved family members. Stellar Doberman puppies are raised in our home and handled all day and night, spend time with young children, and are raised with small dogs. We have webcams that we allow buyers access to so they can log in, and watch their puppies any time they want, day or night. We even hire babysitters when we have to leave the house. Our dogs are bred to follow the standard of the FCI (Federation Cynologique Internationale) the largest canine organization of the world. Our Dobermans are true 100% European, this means there are no American bloodlines. It is important to us to raise gentle, loving, family dogs. We take great pride in our puppies' temperaments and care, and I am happy to post a multitude of pictures and stories of your puppy as it grows in our home and prepares for yours. Puppies will have limited AKC registration, cropped ears, tails docked, dewclaws removed, microchipping, up to date wormings and vaccinations, and a two-year health guarantee (see puppy contract). ​Is a Doberman right for my family? Dobermans are perfect family dogs; most of our puppies live in homes with small children. Dobermans, however, have special needs and require mental stimulation and exercise. As a working breed, Dobermans need meaningful and challenging work. Click here to find more information on the breed. 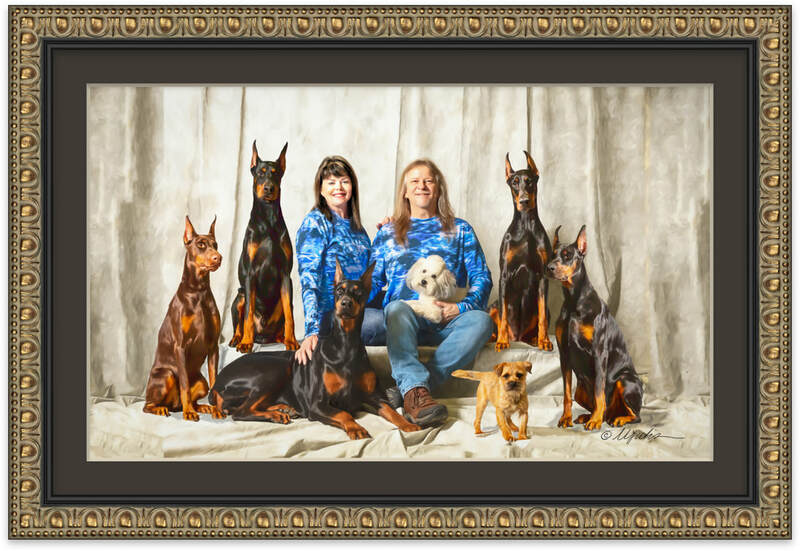 I recently read a great blog that discusses the differences between European and American Dobermans (click here). It has links in the article to both FCI and AKC standards. Stellar puppies will be registered with AKC, however, were bred to continue the European standards according to the FCI. Starting August 1st, 2016 the European FCI will changed breed standards for the Doberman. They will no longer allow cropped ears, or docked tails. Here at Stellar Dobermans, we will continue to dock tails and crop ears as we feel this makes a Doberman appear to be the regal breed that they are. The doberman breed is undeniably superior (that doesn't sound bias does it?). 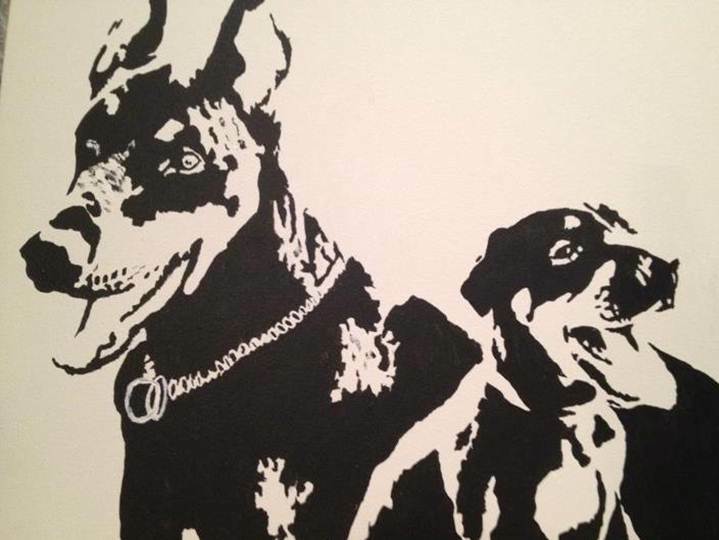 We love ALL Dobermans (American and European) and do not believe one to be better than the other. Some people have their preferences, and we prefer European Dobermans for our family. Our bloodlines will assure there will be no dilutes. Absolutely no "blues" or "fawns." These are an American creation caused from a dilution in the bloodlines. AKC recognizes blues and fawns, but they are not recognized by the FCI. Canvas painting of Portia's mother, Stella, and Portia's sister, Vega, courtesy of Ashley Schmidt. We require a $500 deposit for puppies so we may mark them as pending, however, they are refundable. I know this policy is unlike other breeders', but if you do not truly want one of our puppies then I do not want you to feel obligated based on the fear of losing a deposit. I am not worried about finding another owner for my puppies; no one has ever come to our home to view our puppies and how they are raised and not adopted a puppy. On average, I receive 18 emails and phone calls a month, year-round of people wanting puppies. Puppies will be marked as pending until they are paid for in full and marked as adopted. In the event that our puppies are all pending, and you are still interested please contact me. There have been a few instances where unforeseen circumstances have prevented people from adopting the puppy towards the end. Payment is accepted in cash, cashier's check, or PayPal. We have had several owners pay in several payments rather than one lump sum before taking their baby home, and we are happy to work with you in making these kind of arrangements. PayPal allows you to securely pay using your credit card or bank account. It is free to open accounts; however, PayPal requires a 3% service fee per transaction for businesses which I request you cover if you prefer to pay this way. We will include a PayPal link when a new litter is born. Puppies may be flown with care and only with a certificate of good health from a veterinarian that we will provide when they are at least 8 weeks old, in compliance with airline requirements. Puppies will be flown out of Austin-Bergstrom Airport (AUS), Dallas-Love Field (DAL), or Dallas/Fort Worth International Airport (DFW). Shipping fees will be based solely on destination flight cost determined by the airline, crate cost, and transportation fuel cost to and from the airport from McGregor, Texas. Receipts will be provided for your records. Flights typically cost $200-300 excluding the crate through American Airlines. Travel crates typically cost around $50-100 at pet stores, however, if you find an airline-approved travel crate online for a better price I would be more than willing to order it for you. These puppies will need an intermediate size (300 series, 33 x 22 x 23) crate that has metal screws and an attachable water bowl. The puppies will get ears cropped at 8 weeks old. We apologize in advance, but Stellar Dobermans will not sale puppies with natural ears. There are many reasons for this; Dobermans are a regal breed, the ears are a historic trademark of this breed. If a Doberman is ever to be re-homed, it is very difficult to find a a new owner that prefers natural ears. Starting August 1st, 2016 the European FCI (Federation Cynologique Internationale) will no longer allow cropping, or docking of Dobermans. We at Stellar Dobermans stand with our fellow European breeders and agree this was a bad decision and will continue to crop and dock this breed as AKC standard dictates. You may find our puppy contract and health guarantee on the link below. Contracts must be signed by both parties before the puppy may leave Stellar Dobermans. Both parties will sign a contract printed here at Stellar Dobermans. If you prefer a reference, please select any of the puppies from any of the previous litters and I will happily connect you with their owners. We are located near Waco, Texas.